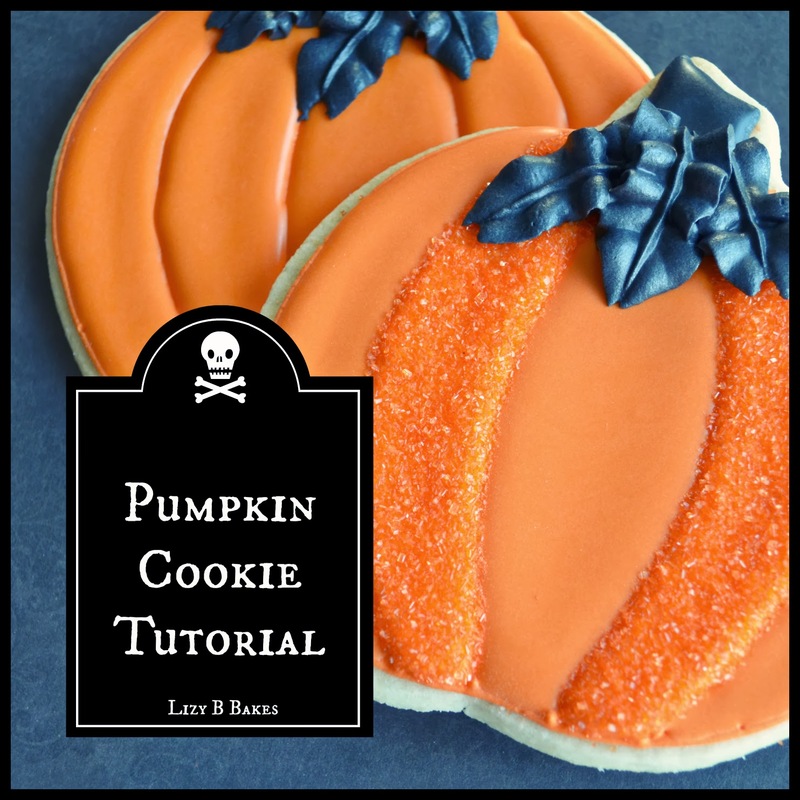 Lizy B: Easy Pumpkin Cookie Tutorial! Let's make some pumpkin cookies!!! 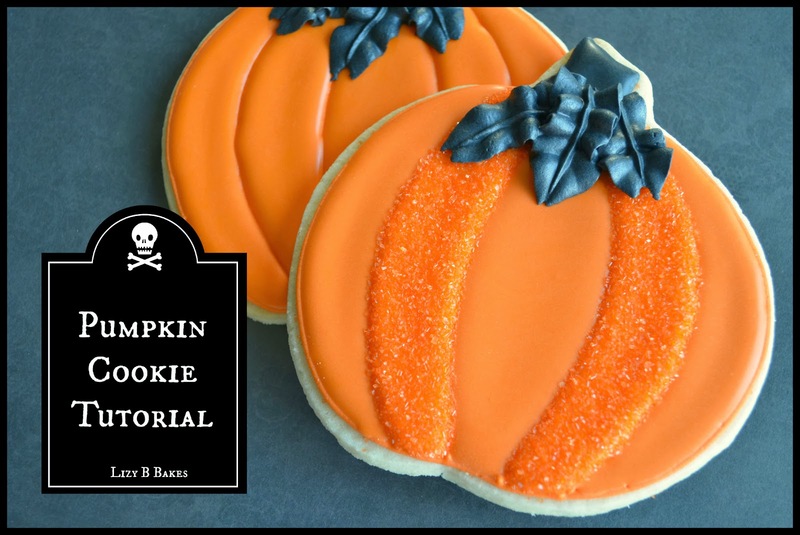 After I posted the mustache jack o'lantern cookies I had a lot of questions! Most of them asked how I made the segments on these pumpkins. So I made a little tutorial for you! 1. Piping icing, which is somewhat like toothpaste, stiff but stretchy 2. 10-second flood icing. Flood icing is regular royal icing that has water added to thin it out. When you cut through your bowl of icing with a knife or spatula, the line you make will eventually disappear. However many seconds it takes for that line to fade completely, is how many 'seconds' your icing is called. Using piping icing and a number 2 tip, outline your cookie. Then draw curved lines dividing your pumpkin into 5 sections. Make sure your dividing lines touch your outline where they start and stop. Fill alternating sections with flood icing. Poke any big air bubbles with a toothpick and set aside to dry for a bit. When the first bit has dried, fill in the rest! Fill these enough to cover your line that divides your sections. You can make them SPARKLY!! let your first sections dry a bit longer-I wait a few hours. You'll need to be able to pick up your cookie and handle it without crushing your icing. I used orange sanding sugar, but white would be pretty too. something to catch the extra sugar and help get it back into your bowl when you're done. Fill your empty sections with icing and wait about a minute or so. Grab a spoon, fill it with sugar, and sprinkle over the wet icing. Or....dump it on, pour it on....whatever. Just cover all the wet parts. Carefully pick up your cookie and let the extra sugar fall onto the plate. Now we just need a stem! Pipe the outline with a number 2 and fill with flood icing. Leaves are made with piping icing and a number 68 leaf tip. For large pumpkins like these I like 3 leaves. Middle leaf last so that it lies on top. Let 'em dry 8 hours or overnight. Here are some other pumpkin and fall tutorials to have fun with!! You make it look so easy that I almost believe I could do this. Nah, I'd much rather watch you do it!!! Hi Lizy. My daughter just started taking a cake decorating course and the first thing they did was decorate cookies :) This looks like a good one for her to try too. I've pinned it to my Cake Decorating board. Thank you for sharing! Thanks for the step by step tutorial - this is great. I wondered how you did the leaves too. Those are awesome!! You make it look so simple. :) I definitely need to give this a try! Wow, my dear you are one talented lady! These cookies are beautiful. I just want to stare at them all day. I am now a follower of you lovely blog. Thank you so much for this great tutorial. I featured it on my blog today and linked back to this post. I also made the chevron ones and they turned out real good !!! I'll send you a link to the pictures once I have posted them. "Bugs & Kisses" Halloween Cookies! Label Cookie Tutorial for Sugarbelle!